Sports Mobile app on your iphone or andriod smartphone. 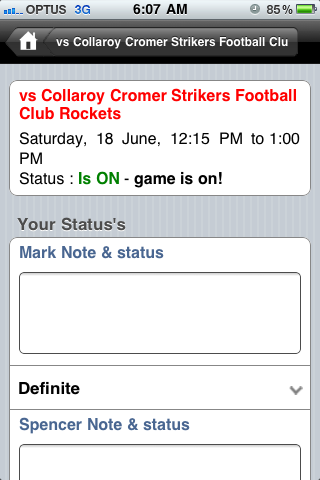 View your sports noticeboard on your Andriod or iphone smartphone. Your sports calendar is now mobile! 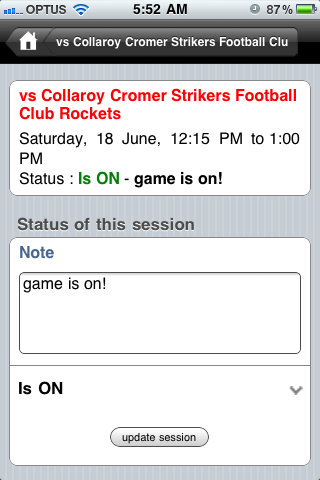 Sports noticeboard allows you to view your sporting commitments on your smartphone. Imagine your school, club, sporting group feeding you information directly to your phone. From the home page, this session view clearly shows more details of the session. Session status : (for managers only) is the session on? Your status : Can you make it? Googe Maps : Where is the match being held? Use this mobile sports app to let your team know the game is on! Letting your team know that you can make it is easier. Also let the team know if your the coach that you can make it! On the sports noticeboard your manager, club or school can load the entire season of games which can be viewed by you on your mobile phone. 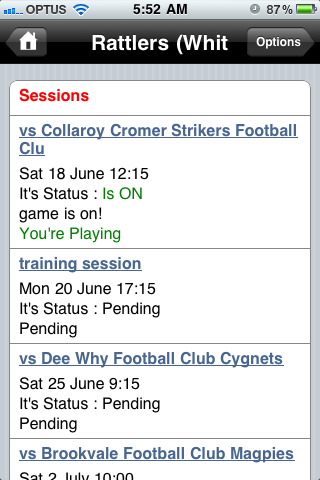 See all the upcoming games, the status of the session, the game time and if your selected. All sessions can be clicked through for more information including the address, a forum about the game and the ability for you to change your status.